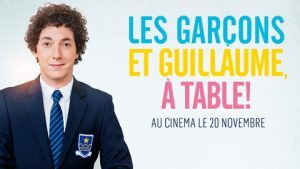 Les Garçons et Guillaume à table (Me, Myself and Mum) is a 2013 French autobiographical coming of age comedy film written, directed by and starring Guillaume Gallienne. The film premiered at the 2013 Cannes Film Festival and was released in France on 20 November 2013. In January 2014, the film was nominated for ten César Awards and won five, including awards for Best Film and Best First Feature Film.